✏Tuition Care Explained - Learn How You Can Save 💲💲 On Your Tuition! Calling all MTC Families and Supporters! Please take a moment to read below and consider participating in the Tuition Care Plan. 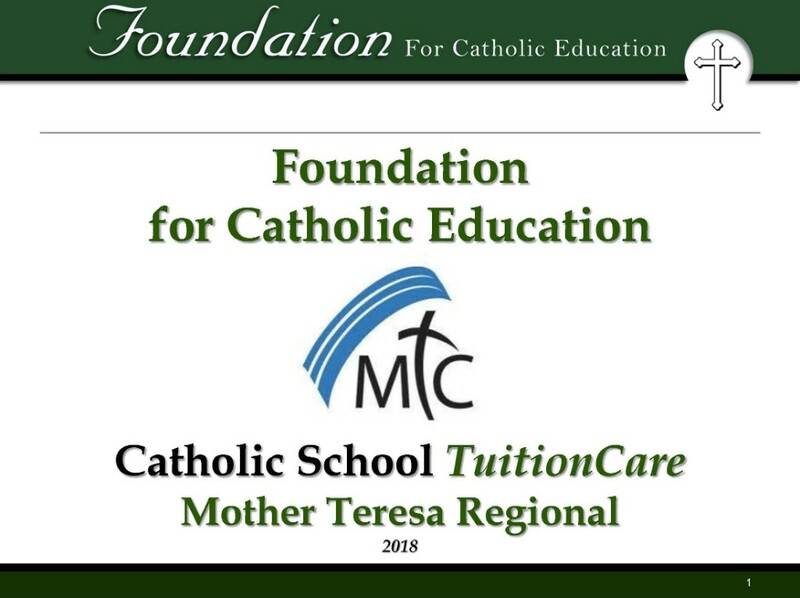 The Foundation for Catholic Education has selected MTC to be part of a pilot program that could reduce tuition by up to $1,000 per family next school year. The amount of tuition reduction will be dependent on how many families sign up to participate in the Foundation’s SPE that allows individual taxpayers (not just businesses) to redirect their Pennsylvania state income taxes to the Foundation’s scholarship program instead. Below is a detailed presentation describing the program, as well as a one page form that needs to be completed and returned to either John Sion (chair of the MTC Tuition Care Committee) or Judi Neeld at the Foundation. If we get 150 people to sign up, every K-8 school family will receive a $1,000 tuition reduction credited next spring. If we only get 75 sign-ups, we receive 75/150, or 50%, which is $500 per family. Keep in mind when you sign-up you are pledging to donate a certain amount to the Foundation SPE in the November 2018 timeframe. The amount you pledge should not exceed your likely 2018 PA income tax. You should ask your accountant or look at line 12 of your PA-40 tax return to determine the maximum amount to donate. For example, if you paid $1,000 of PA income taxes, you can pledge up to $1,000. If you paid $3,000 of PA income taxes, you can pledge up to $3,000. (You can also pledge less than the maximum, there is no minimum commitment.) When you then file your tax return in the beginning of 2019, your tax bill will be reduced by 90% of whatever you paid into the SPE. For most people this means that Pennsylvania will pay you a tax refund next April of 90% of what you donated to the SPE. In order to get the full 90% credit, you are signing up for a two year commitment. So the 2018 pledged amount will then be expected as a 2019 pledge, for which you will similarly get a 90% tax credit again. Another benefit to redirecting your State tax dollars is it’s tax deductible on the federal return as a charitable contribution. If you pledge for a certain amount now and your financial situation changes by November, the Foundation will understand and you will be allowed to cancel your pledge. Also, in the unlikely event that the Foundation does not receive Pennsylvania state funding for their grant, then no one will have to actually fund their pledged amount (but neither will we receive the Tuition Care grants). Any Pennsylvania state taxpayer can participate in this program and count toward our 150 family goal. Therefore, grandparents, aunts, uncles, parishioners, etc. are all eligible to participate. Most everyone pays at least something in Pennsylvania income taxes, so this is a great way to redirect those tax dollars to Catholic education and also directly reduce next year’s tuition, too! The deadline to return the one page form to either School, the Tuition Care Committee, or directly to the Foundation for Catholic Education is June 15th. No money is due now, but the Foundation will be in contact in November assuming it is approved by the state. So please don’t delay, get those forms in immediately! If you have any questions, please don’t hesitate to contact either Judi Neeld at the Foundation or any member of the Tuition Care Committee. THIS ADDRESS IS NOT MONITORED.